Remind is a free, safe and simple way for educators to instantly text-message students, parents and other educators. The school can send Remind messages from their computer or free smartphone app, and students and parents can receive them on ANY device, including "flip" phones. Jones can also schedule messages to go out in advance, and attach photos, files, and Voice Clips to their messages. Messaging is safe because phone numbers are kept private (texts do NOT come from your phone number), and a recorded history transcript is kept for all messages. Remind also lets educators translate their messages into over 70 languages. See how Remind works to help you connect to Jones College Prep, and stay updated on everything happening at the school. You'll receive a welcome text from Remind. 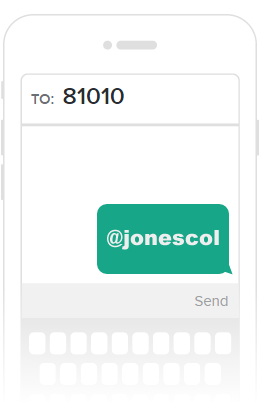 If you have trouble with 81010, then try texting @jonescol to (928) 379-6190. Download the app on the Apple App Store (iOS) or Google Play (Android) to turn on mobile push notifications.